General Motors announced that the Pontiac G8 ST, also known as the “El Camino” to car-truck diehards, will not go into production after all. The automaker canceled the project leaving the G8 sedan to soldier on alone. When GM released the Pontiac G8 last spring, I was thrilled to see that the automaker had finally given the brand a car worthy of the Pontiac name. The G8 is a bold, strong, rear wheel driven five-passenger sedan based on the Australian Holden Commodore platform, just the sort of car needed to redefine the Pontiac name. 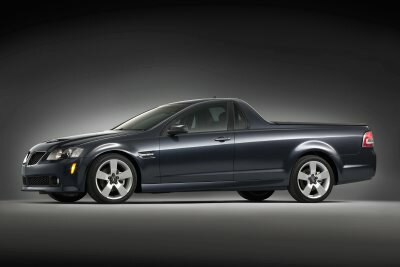 Along with the G8, GM had said that a car-truck version of the vehicle was going to be developed, an “El Camino” type truck that stirred the hearts of people who desired to see such a vehicle brought to market. When GM announced a contest to name the truck, the El Camino name received a strong response, but the automaker decided to go with the ST which is a rather dull abbreviation for sport truck. Alas, the G8 ST will not go into production after all according to sources within and without General Motors. The company placed the project “under review” last month as part of the automaker’s review of its entire portfolio. Though GM hasn’t said whether Pontiac itself is dead, the automaker has no plans to bring the Pontiac G8 ST to market. As far as this ST fan goes, I am personally very disappointed, though not entirely surprised by the announcement. Originally slated to launch late this fall, the ST would have been a nice complement to the sedan. But, with GM sales tanking and the world in the grip of a worsening recession, the ST project has been canceled. This may actually work to GM’s favor as the ST would have been a low volume vehicle in the first place. With gas prices remaining unstable, the ST’s survival would be threatened when gas prices climb as they are expected to do later this spring. R.I.P. Pontiac G8 ST…we hardly knew ya! See Also — Will the Ram Rumble Bee Sting the Ford Tremor? Photo copyright General Motors Company.